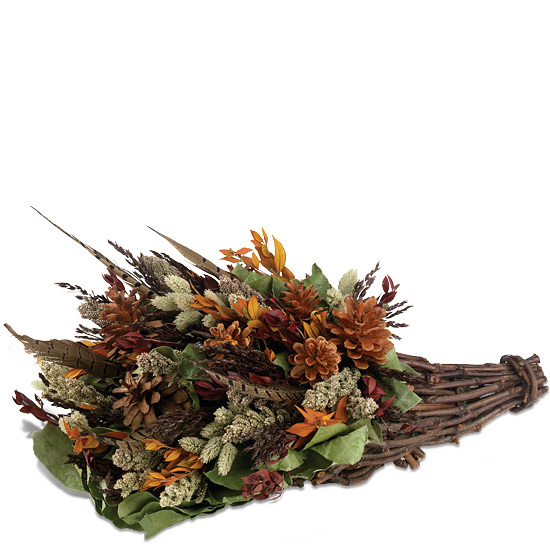 An intriguing departure from the traditional flower or fruit cornucopias seen so often this time of year, our creative design gives “horn of plenty” a whole new meaning. It overflows with uniqueness, sophistication, and beauty, impressing with its gathering of red and orange myrtle, brown sudan grass, preserved phalaris, and pheasant feathers. A true centerpiece, it looks equally as interesting from every angle and makes the ideal décor for dining room, entryway, or living room.